Three missions in the northern part of Luzon in the Philippines have been reorganized to create a fourth mission, the Philippines Laoag Mission. 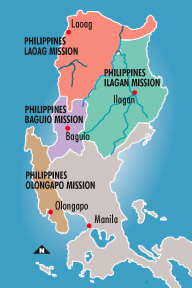 The Ilagan, Baguio, and Olongapo missions, with a combined estimated population of 7.6 million residents, were reconfigured to create the Laoag mission, the 14th mission in the Philippines. The mission will be headquartered in Laoag, located on the northwestern tip of the island. The new mission was created in October, making it the 338th mission of the Church. About 18,910 members reside in the Laoag mission. Stakes within the mission include Batac, Laoag, and Narvacan. Districts include Aparri, Ballesteros, Bangued, Bangui, and Vigan. Jerry W. Hatch of the Idaho Falls Seventh Ward, Idaho Falls Idaho North Stake, has been called to preside over the new mission. He will be accompanied by his wife, Marilyn Kay Hatch. At the time of their call, they were serving as senior missionaries in the Philippines Area. Adapted from Church News, 25 September 2004. Three existing missions in the Philippines were reconfigured to create the Philippines Laoag Mission, the 14th in the Philippines and the 338th in the Church. Church members in St. George, Utah, know many ways to remember Christ during the Christmas season, and one way is to provide an opportunity for others to learn more about Him and His Church. For the past four years, members have invited the community to a nativity festival, to be held this year on 3–4 December at the Green Valley Stake Center. The festival has grown every year, with almost 2,000 visitors viewing the displays last year. At this year’s festival, more than 100 paintings and 500 nativities from around the world will be on display. One nativity was made from mud and dried in the sun by children in Africa﻿—the fingernail marks used to create the eyes and mouths of the figures are visible. A nativity from Russia is made of brightly colored, hand-painted wooden figures. Another shows Mary and the Christ child dressed in Chinese silk. Some 65 Church members from throughout the country met in Zakopane, Poland, on 3–5 September 2004 for the second all-Poland young single adult conference. They enjoyed both recreation and gospel learning activities. Friday afternoon included time to explore Krupówki Street, a tourist attraction in this internationally known ski-resort city. Saturday included a brief visit to historical sites and a conference session that took place during a hike into nearby Tatrzanski National Park. In a meeting on Saturday evening, they heard counsel from Poland Warsaw Mission president David J. Barnett. On Sunday, the conference ended with a fast and testimony meeting. This issue of the Ensign includes a sheet of pass-along cards offering the Church’s Joy to the World DVD. The DVD includes the story of Christ’s birth as experienced in both Jerusalem and the Americas, music by the Mormon Tabernacle Choir, and an introduction to the Restoration of the gospel through the Prophet Joseph Smith. Those who call the toll-free number on the card will be given the option of having the DVD delivered to them by mail or by missionaries who will also share a message about the Savior. When giving the pass-along cards, allow enough time for delivery of the DVD. Copies of Joy to the World and additional pass-along cards are also available through local distribution centers. Various creches at the Green Valley Stake’s Nativity Festival in St. George, Utah, draw thousands of visitors each year.